I have recently developed a taste and appetite for pastries and cake hence my new adventures in following sweet blogs and facebook pages and baking all week long! My kitchen cabinets are now equipped with a whole new set of baking ingredients and tools, and my ever busy oven now emanates wafts of cinnamon and vanilla, making me fall in love with my kitchen all over again. The learning process has been challenging and extremely fun. So I thought why not share my experience of this newly acquired skill. May other beginners find some insight into the baking ways and may the old timers enjoy my proudly presented new section: Cakes and Pastries! Unlike cooking, wherein creativity and intuition is a major player, in baking it is “precision” and “accuracy” which plays the most essential part. This is not to say you cannot be creative or should not use your intuition when it comes to baking. You certainly could and should if you have the gift for it. The point is that you cannot get away with NOT being precise – precise measuring, precise temperature, precise length and method of mixing are all crucial factors in producing a good cake or pastry. So, do not even think of baking without first buying appropriate measuring cups and spoons! I think it is safe to say that baking takes more organization and patience. Do not start baking if you are in a hurry or if you are not in a good mood – not if you are a beginner like me. Again, unlike cooking where you might remedy a mistake in the recipe while you are in the process of cooking, (if you are a good cook that is) in baking, your cake either turns good or does not make it in the platter on the table at all. Practice makes perfect though; have no doubt about it! My final word of advice at this stage is: Start with easy recipes so you will not get disappointed easily. And rest assured that the joy of baking cakes and pastries is as great, if not greater than that of cooking. So let us start with a real easy and tasty one! Self-rising flour, 2 cups or 300 gr. Light brown sugar, ½ cup or 110 gr. Overripe banana, 1 cup or 300 gr. Muffin tins, medium size, one 12 thins or two six tins. Remember we said precision is the key to baking? Well, The very first thing you need to do if you are about to bake pastries is buying measuring cups and spoons. In addition, you must know how to measure correctly. This video helps. Another basic lesson all bakers to be need to learn is how to “fold” the batter, which is different from mixing and so detrimental in the final product. It’s not complicated at all. Watch here . Preheat oven to 180 C or 350 F. Lightly butter your muffin tins (use spray or melted butter). In a large bowl, sift self-rising flour, cinnamon and brown sugar together. Brown sugar is usually lumped and needs a hand to go through sieve. Mix the dry ingredients and make a hole in the middle. In a small bowl, beat eggs with a fork for one minute. Then add vanilla and milk and stir well. In another small bowl, mash bananas. Add melted butter + mashed banana + egg/vanilla/milk to your main big bowl in the middle of the flour mix. Using a large spoon, or a rubber spatula gently fold until you make sure everything is mixed well. The batter is not going to look homogeneous; that’s okay. Spoon the batter into the muffin tins to fill them almost two third of the way. Give them a rap on the counter to get the batter settled. Gently press chopped walnuts on each muffin. Place in the middle of the oven and bake for 25 minutes or until toothpick stuck in the muffins comes out clean. Let cool for three minutes, then turn the muffins out on a rack until it is completely cool. Just a rookie and I am already getting creative with the recipes, exploring different tastes, experimenting with different mix and combination and having tons of fun. Here is one of my successful creations inspired by the banana muffin recipe with a sweet -sour taste and refreshing fruit aroma. 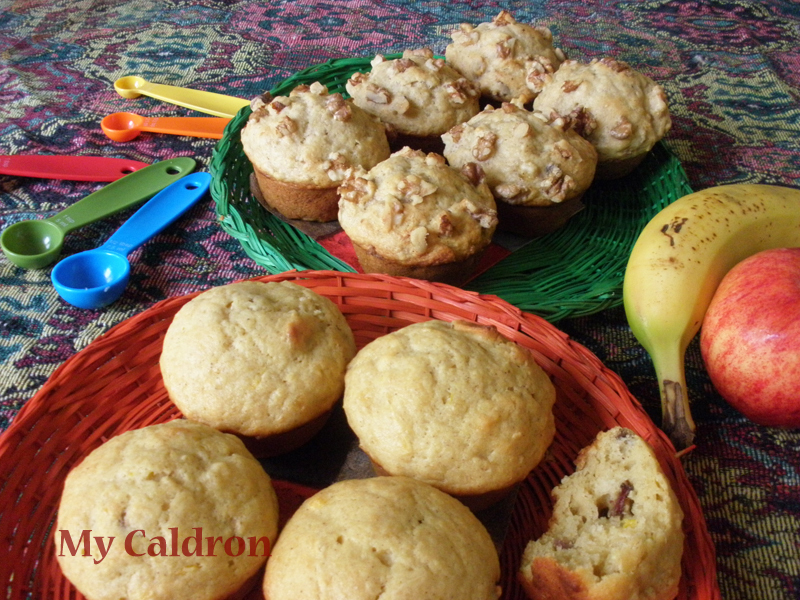 The method is exactly the same, only chopped dried fruits are fold in the batter instead of being spread on top of the muffins, as walnuts would. Take a note of this easy and savory “sauce” as it comes handy in many types of pastries and cakes, including a few I have on my list for the future blog entries. 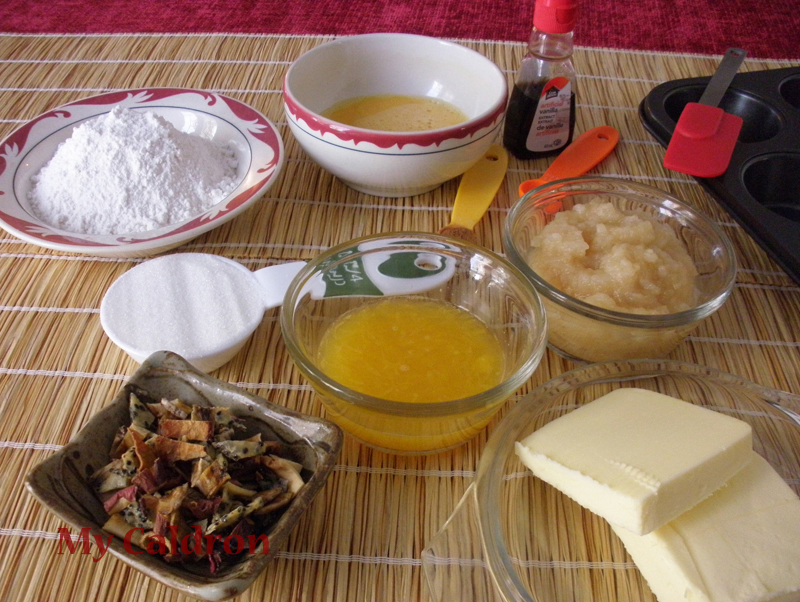 For this recipe (fruit mixed muffin), you need 4 Macintosh apples (other kinds of apple result in different tastes). 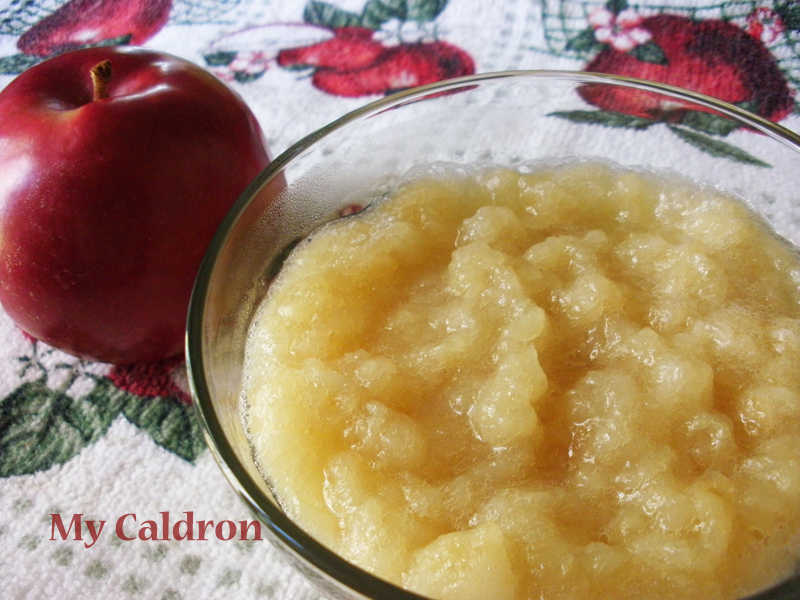 Simply peel, core and chop apples and transfer in to a medium pot. Add 1 tbsp. water and 1 teaspoon lemon juice and cook with closed lid over low heat until soft – in about 30-45 minutes. Mash with the back of a spoon and let cool. Done! 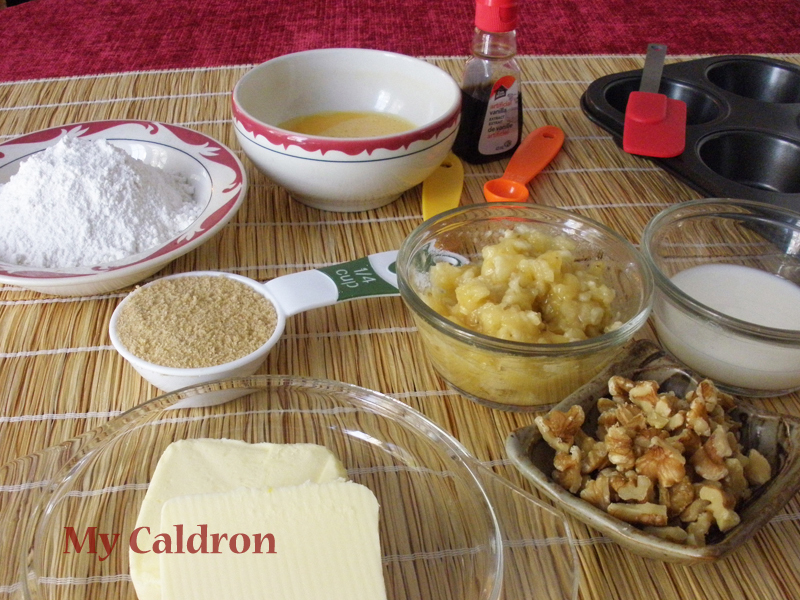 Have a sweet baking experience; I will be back with more!